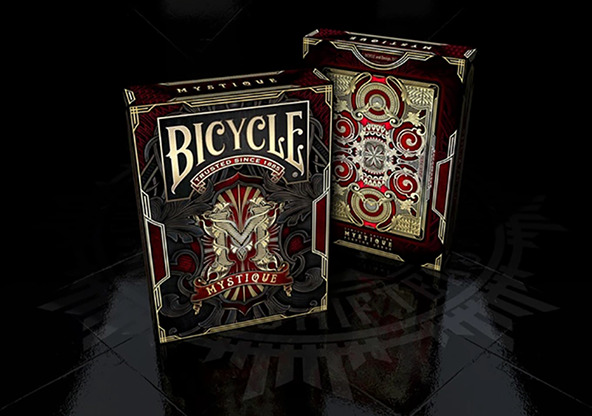 The Mystique deck is an enchanting set of playing cards, designed by Shapeshifters Playing Cards, and produced by Gambler's Warehouse. 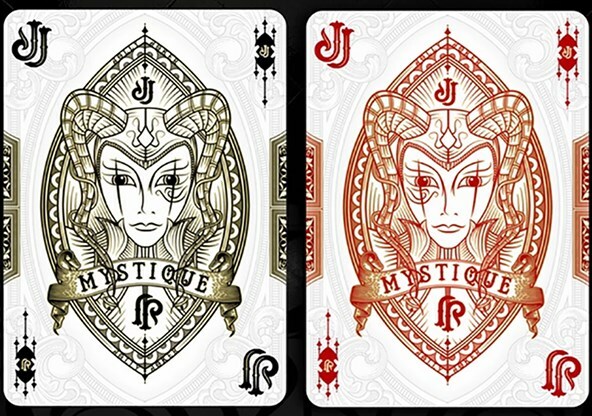 The word mystique means "a framework of doctrines, ideas, beliefs, or the like, constructed around a person or object, endowing the person or object with enhanced value or profound meaning", and it is this aura that these mysterious cards set out to evoke. 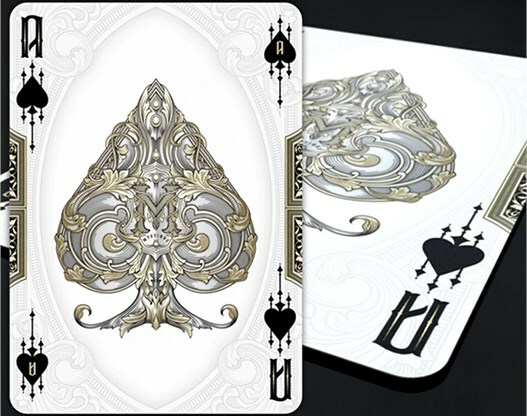 They picture a world of indefinable allure, which begins with the swirling patterns and complex design of the card-backs, and is also evident on the incredibly ornate and intricate coils on the over-sized Aces. Even the Joker has a mysterious look about it! 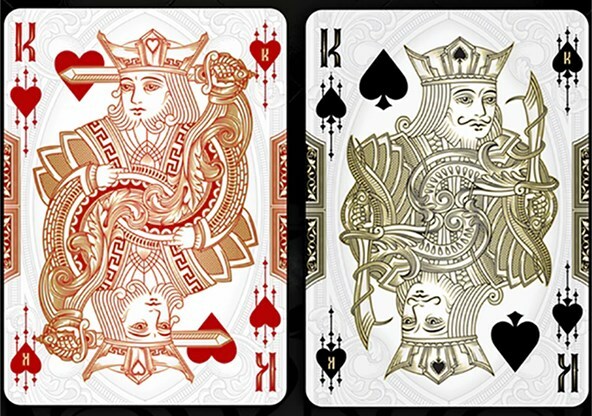 The court cards have extremely elaborate and rich designs, and the detail of the artwork is emphasized with a largely mono-coloured look. 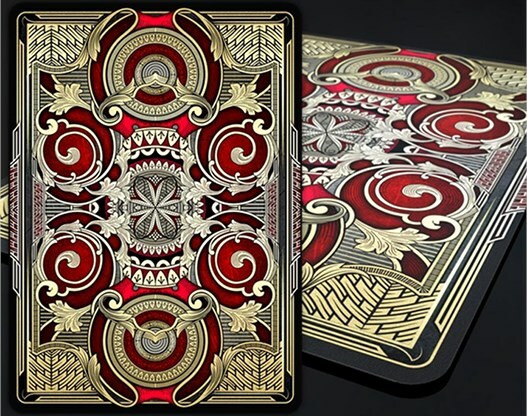 This minimalism of colour enhances the complex and original designs; it also ensures that the red and black suits are very clearly distinguished, making this a very functional and playable deck. If you look carefully, you'll notice an elaborate watermark-style background, which is evident also on the number cards. You'll also observe that even the pips are decorated with ornate lines. That's what this deck is all about - ornate decorations that you can lose yourself in. 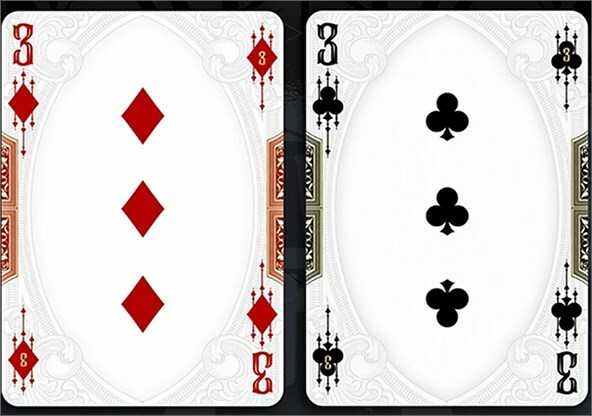 Another unique aspect of this deck is the fact that the pips are also displayed on the top right corners, which enhances the beauty of a right directional fan or spread. The middle of the cards also has a full bleed band that goes right to the edges, which also makes a spread or fan look absolutely fantastic. While this does carry the risk of making the deck marked in terms of colours, I don't find it to be a huge issue since the only differential is between red or black, so even the suit isn't given away by a face-down card. This deck also comes with two extra cards, a gaff card (double-backer) and a promo card. The quality and handling of the cards is excellent, as you'd expect from a USPCC printed deck.